SCMS Cochin School of Business draws an interesting and diverse talent pool. Students from all over the country, year after year, stand out due to their unique strengths and achievements, which make them Stars on Campus. 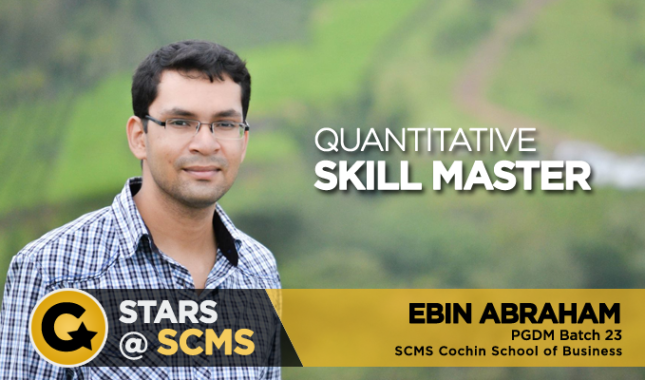 Ebin Abraham, in house “quantitative skills master”, is one of them. On the back of his skills, Ebin had already made it through the prestigious banking exams; but, he chose to do his PGDM with the institute. Here he tells us what prompted the decision that has already had a huge positive impact on his life. Ebin is quite matter of fact about his achievement and also his decision. “Yes, I got through the banking exam but I realized that a PGDM degree is important for the growth that I want in my career,” he says. “There is a growing need for managers in the industry and a PGDM program prepares you for that. In fact, it has its advantages over MBA programs as well, because the curriculum is regularly updated to keep up with industry requirements.” These were some of the factors, in addition to the reputation of SCMS Cochin, that brought him here in the first place. According to Ebin, studying at one of the best B Schools in South India has been a thoroughly enriching experience so far. He talks about the impact it has had on him, saying, “The IMLP program where we have to make presentations has helped me get over my stage fright. I have also overcome my inhibitions of expressing myself in English. There are a number of activities held in college, the management fests etc., which have boosted my confidence.” He definitely seems to have come into his own and is ready to make his mark in the industry. Ebin is also mindful of the fact that the internship will give him an edge when he goes out in the corporate world as a professional. In many ways it can make him stand out from MBA graduates, too. “The main difference is that PGDM offers a three month internship while there is only a month long internship for MBA students,” he explains. “The substantially longer period of time gives you a better understanding of what happens in the company. It’s this comprehensive knowledge that I came here for and the program has met my expectations brilliantly.” Ebin concludes on an optimistic note – he is confident that his institute will help him achieve his professional aspirations. IIM Lucknow’s Manfest-Varchasva 2015 presents Young Leaders Program – Shaping the Leaders of tomorrow!